A few months ago I was the stereotype European cigar smoker, taking only Cuban puros into serious consideration but at the same time pretty ignorant about all the amokes from other Central American countries. It all changed when I met a fellow Italo-American cigar lover who probably prefers to remain nameless (you know who you are Mr.) who gave me a chance to try many non-Cuban smokes, overcome the stereotypes and learn a lot in the process. Over the Autumn I received a few smokes from this real BOTL, so much so that some of the smokes landed on the bottom of my humidors and were more or less forgotten: a couple of days back I was rummaging through one of my humidors and found this 5 Vegas (Cinco Vegas) Classic 55 which I had completely forgotten. Definitely time to give it a go. I had never heard of the 5 Vegas brand till recently and with the exception of their website (not very informative on the brand itself, more on their cigars) and the “Established 1890” on the band I initially couldn’t find much. After a bit of google-research the origin and recent history becomes a bit clearer. 5 Vegas was one of the hundreds of 19th century Cuban brands but the modern brand has little to do with the old one. Don Kiki Berger started the “modern” 5Vegas in Nicaragua around 1994; unfortunately when the financier of the venture passed away the brand went into financial difficulties and had to stop production (as Kiki Berger explains in this interview). The brand was later brought back to the market by the person behind Cigars International – not surprisingly 5 Vegas as a brand is quite evident on the notorious internet cigar store. According to rumors the original 5 Vegas classic blend is now sold by Cuban Crafters as Don Kiki Red. Since I have some of these at hand, I will definitely see how they compare. Box pressed definitely means it here, the cigar has a square section and feels like holding a dice in your mouth… not really on top of my list when it comes to cigars. Apart from this, the wrapper is a bit rustic with a couple of discoloured spots but otherwise OK and pretty free of veins. The pre-light draw is nice and free but without any particular taste apart a general tobacco. The burn on this fifty five was a bit crooked, from start to finish. My impression was that part of the fault was from the box pressed shape, as one of the corner/edges constantly burned slower than the rest. On top of that the cigar suddenly went out at about the 2/3 point; no idea how that happened as I was regularly puffing away at it. The ash is pretty impressive. I enjoyed the free (but not too much) draw and the smoke produced is OK but not any more than that. The start is very interesting with lots of pepper spice, cocoa and some slight sweet herb finish but quite quickly the taste goes into a rather simple earthy tobacco with a bit of Nicaraguan spice and… nothing else much for the rest of the cigar. 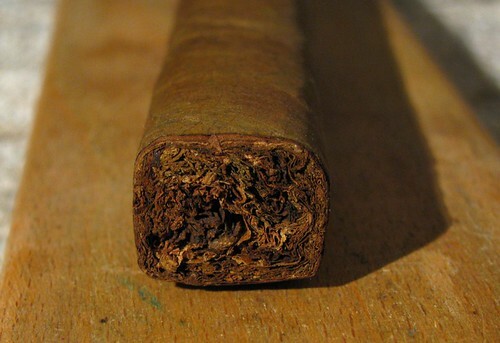 The cigar leaves you waiting for some evolution, but there is not much to keep the interest honestly. The only change is a little woodyness that progressively increases towards the end, but it’s too little too late. Unless you’ve skipped the review up to this point, I think I made my impression of this cigar relatively clear: it is not a bad smoke as such, but for my taste it is just to simple to keep me interested for the hour and more this lasts for. It is not a cigar I would particularly look for based on my taste. On the other hand, for a 3 $ smoke it isn’t bad as such; yes it is rustic and has light burn issues but if you like a regular smoke on this flavour palette then this might as well be a good everyday option. Point-wise this gets a middle of the road 80. This is the second of the 5 Vegas range I smoked -the other being a Gold, and up to now I am not particularly impressed. Still have a Relic and Cask strength to try, so maybe I will change my mind… you never know. This entry was posted in Cigar Reviews, Dominican, Nicaraguan and tagged 5 Vegas, Cigar Review, cigars international, Don Kiki Berger, Nicaraguan cigars. Bookmark the permalink.